In 2015 I just finished my Bachelor in Media Management in Berlin. Instead of starting to work or to continue studying with a master degree right away - my neighbor Max asked me to follow him hitchhiking direction "East". I decided to do so. With this trip the idea for TheStoryBehindTheLabel grew. I wanted to show what I was lucky enough to see and take people along, may open the eyes for some as countries, cultures, religion, nature, politics existing next to their very own. After many journeys I already did, I felt ready to share my experience and show what you can learn from different cultures. Moreover I focus textile indurstries as a topic of global connection by trade. I was already engaged with the campaign Fashion Revolution in Germany and I believed ever since in a change in textile and fashion industries as necessary. "A change" is quite a big word for an industry acting globally with economical, political, cultural -impacts. So what I do to change: I just start talking about everything which is related to it. 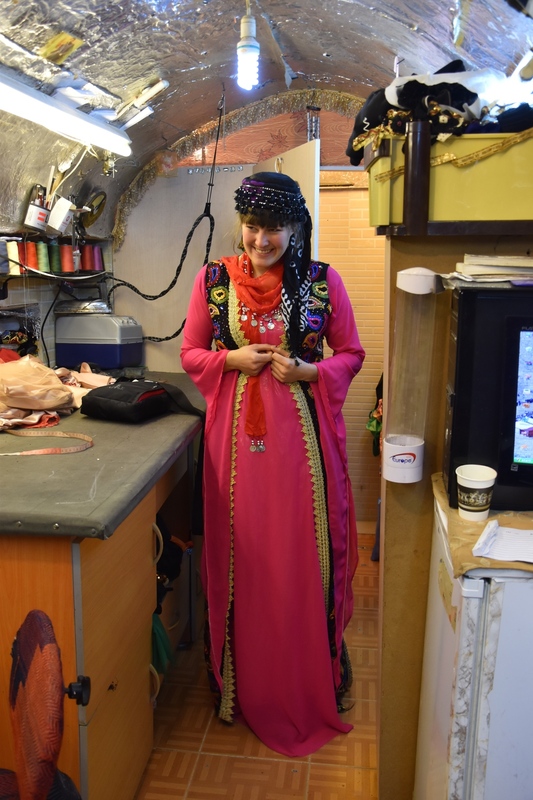 We slept on the floor, under one blanket with seven other men, in Trucks, in a chicken hut, on finest Persian carpets and we did not regret what we learned from each of these moments. More about that at Max blog. Before all this Fashion was the last thing I was interested in. Beeing pretty, buying the latest style did not satisfy me. Moreover while studying in Dublin - the home of Pennys/Primark - every kind of fashion seemed possible to have, for nearly no money and not worth to think about it. It was my todays best friend, who studied Textile, who started to tell me whats happening behind the production of clothes I am wearing. I got to know about Monsanto, Rana Plaza and Fashion Industries in Africa, clothes donations and slavery. This was the first time I started to think about fashion and it impacts and realized, eventhough I simply wear "any clothes" I have a huge impact on fashion industries. I noticed there are many more, just like me, who just don't know anything about it. So I thought why not taking you with me on my journey learning about it. Simple. No time frame, no destination to reach, always looking for production and culture everywhere. Max packed his bags and hitchhiked from Berlin onwards. After 7 weeks I joined him in Istanbul, Turkey. We hold our thumb out and made it through Turkey, Georgia Armenia, Iran to India. We mainly couchsurfed, we sometimes camped, we rarely used hostels, Airbnb or hotels. We reacted to the things/people/cultures/moments/trouble areas while they happend to us and in fact it lead the way we really went. Yes. I am afraid of an misunderstanding. This blog was not to bring the "western opinion" to the East. This blog is made for people who want to see, read and experience the East with me, seeing- and letting go of sterotypes. It is made to show the beauty behind something different than the western standard. I am taking everybody who wants to on my journey to experience something, which happens besides the loud voices of money in advertising. And still this also doesn't mean that advertising and money is a bad thing - TheStoryBehindTheLabel just focusses on everything what happens next to what's obvious. I am going to travel and you will find a lot of pictures from people who more likely speak English than German - And I want them to understand what is written here. Some of my best friends are English-speaking and I want them to participate. To be honest being naive, stupid and just not care would probably be an easier life. But I can't. I was lucky in my life. Being born in 1991 as a girl in Germany is like hitting the jackpot. I grew up in total freedom, was able to participate in higher education, enjoyed exchanged programs in school and I went half a year abroad when I was 16 to New Zealand and learned a lot about myself and independency, after school I was traveling around the world, experienced China with my two best girlfriends, I studied and tuck an semester abroad in Dublin and met the most amazing people on this planet, who taught me that life can still be good when everything goes wrong, then I landed in Berlin and met inspiring people in this vibrant city - like my neigbour Max, who took me on this trip with him, which makes me telling the Story behind the Label to you. I am struggeling with the fortune of these experiences. I do not know to do any better with them then sharing them as a little reward to all people, their countries, cultures, religion and believes I benefit and learned from. The only skill I use from myself is an open-minded mind and willingness to respect and risk anything that might be diffrent than my own comfort zone. It is learning before judging.